On Saturday, with Philippe in pain, I drove us back to Paris. For the next couple days, Philippe was under the weather and in search of dental help. So, I spent the time taking day trips into Paris while Philippe stayed at his parents house. The weather both days was cool and rainy; perfect museum weather. Monday's trip included the Louvre where I visited Mona and Venus, followed by some great Greek food in the Latin Quarter. Tuesday included the Museum of Modern Art at the Pompideau Center and a stop at the Hard Rock Café. After a visit to the Dentist, Philippe was finally feeling better by Tuesday. That day, we drove to the famous Champagne village of Reims, about two hours NW of Paris. 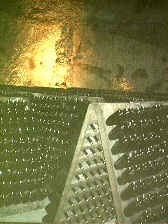 We toured the cellars of Pommery, Piper-Heidsieck, and Veuve Clicquot for tours and tastings. Of those cellars, Clicquot was the best. I bought a couple bottles of the Clicquot tète de cuveé, La Grande Dame. Wednesday morning I said my good-byes to Philippe and his family and left for Hannover, Germany.